Let's trade using computer science! My name is Chris, I'm a Dutch engineer with Polish roots. 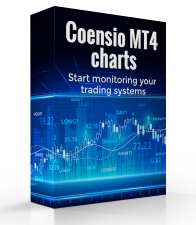 By day I'm an engineer, system trader and an internet entrepreneur, and by night I'm fighting internet crime;) I hope you will enjoy my website and my free MT4 software. Do not forget to check out my blog. B.t.w: 'coensio' (Latin) = assessing, assessment, census, estimating, opinion, rating, taxing.